If you wanted a great cup of coffee in the 17th century, you would have to grind your beans with a mortar and pestle, or with a spice mill. This time-consuming process meant that getting a great cup of coffee was no easy task. 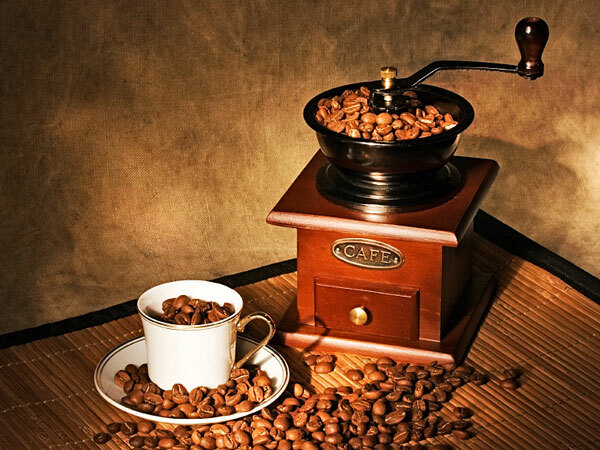 Coffee aficionados know that the freshest, tastiest coffee comes from beans that you grind yourself. A coffee grinder grinds beans into smaller pieces so that the surface area is increased, which allows for more efficient extraction. As a general rule of thumb, the finer the bean is ground, the faster extraction occurs. So how fine do you want the bean to be? That depends upon the type of brewing you are doing, as well as the type of brewing equipment being used. Hand mills are still available and can grind surprisingly uniformly, but they are very time consuming. Most hand mills are adjustable, allowing particles to be ground coarse, medium, and fine. However, hand mills are not capable of grinding finely enough for certain coffee beverages, such as espresso. 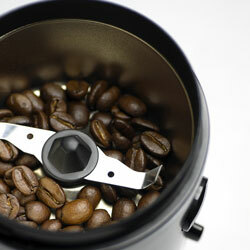 Most people who grind their own coffees opt for electric grinders, due to their convenience and versatility. The two basic kinds of electric coffee grinders are blade grinders and burr grinders. The blade grinder is the most economical of the electric coffee grinders, and is comprised of a blade, motor, and receptacle for catching the ground beans. With this type of grinder, beans are ground into smaller particles by the rotating blade. Coarse grounds can be achieved by running the grinder for a shorter amount of time, while finer grounds can be achieved by running the grinder for longer periods of time. One concern with blade coffee grinders is that it is often difficult to achieve uniformity in grind size. If the grind size is not even, the extraction will also be uneven, and can cause bitterness, sediment in the coffee, and clogged coffee brewers. The other kind of electric grinder, the burr grinder, has two metal discs or cones that grind the bean between them. Conical burrs are often found on more-expensive, commercial coffee grinders. As a rule, burr grinders can achieve a more uniform grind size than blade grinders. Burr grinders are differentiated by features such as timers, the number of speeds and adjustments, and automatic switch-offs. Some burr grinders have specialty settings to grind beans for espresso and Turkish coffee drinks that require very fine particles. Bunn - commercial coffee grinders. Capresso - burr ginders and blade grinders. DeLonghi - burr and blade coffee grinders. Krups - burr and blade coffee grinders. La Pavoni - espresso burr grinders.